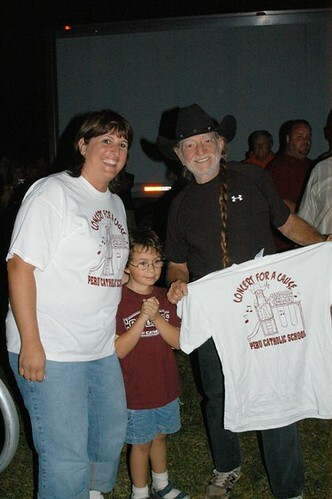 Willie Nelson with Billy Samek and his mother, Tammy, before the ‘Concert for a Cause’ onÂ September 22, 2007, at the Lou LaGrotto’s in Peru, Illinois. This entry was posted on Tuesday, January 18th, 2011 at 9:20 am and is filed under Good causes, Thank You Willie Nelson. You can follow any responses to this entry through the RSS 2.0 feed. You can leave a response, or trackback from your own site. i was searching for a song of yours to send to my husband, and came across this site; You Are the Best!!! God Bless and Really, Really Hope You outlive the rest of us; we Need You. sorry this is so late, but Kudos to you all at Lou’s La Grotto RestStaff and students from 62 schools in the Illinois Valley & to Merry Noonan and her six-member committee in Peru, Illinois & your “Concerts for a Cause” series. And to All of the teachers, parents and Students who participated !!!! Hope it worked out well! !